Once the Law and Justice Party (PiS) took power in Poland, relations between the new Polish government and the European Union started getting complicated. On Jan. 7, Polish President Andrzej Duda signed a law empowering the government to directly appoint the heads of public broadcasting companies. The new law has caused an uproar in Europe. European Parliament President Martin Schulz accused the Polish government of the «dangerous Putinization of European politics». «The government in Warsaw sees its election victory as a mandate to subjugate the welfare of the state to the will of the winning party», said Martin Schulz in an interview with Germany’s Frankfurter Allgemeine Sonntagszeitung, «This is managed democracy à la Putin...» Speaking of the upcoming plenary session of the European Parliament regarding the current situation in Poland, which is scheduled for Jan. 19, Schultz emphasized that now the entire democratic political spectrum «from left to right can say for sure that such a policy is in conflict with basic European values». Specifically, the provisions of the new Polish law that have provoked the outrage of European politicians are the ones that make it possible to dismiss the members of the management and supervisory boards of Polish Public Television (TVP), and Polish Radio (Polskie Radio) before their contracts have expired and which also render the hiring for those positions non-competitive (from now on members of the management and supervisory boards will be appointed by Poland’s treasury minister). Brussels is guessing that the Law and Justice Party has yet more extensive reforms in mind, and that the establishment of rigid state control over television and radio is just the beginning. In this instance, Schulz’s crack about the «Putinization of Poland» can be safely ignored – that Eurocrat has such a formulaic mindset that if tomorrow Recep Erdoğan broke up an ordinary protest march in Ankara, Schultz would point to that as another example of «Putinization». It is more important to give some thought to the new political trends in Eastern Europe. The meeting on Jan. 6, 2016 between Jarosław Kaczyński and Viktor Orbán in southern Poland was certainly worthy of note. The arrows of criticism being aimed at each of these politicians by European liberals seem to be driving them into a closer relationship. 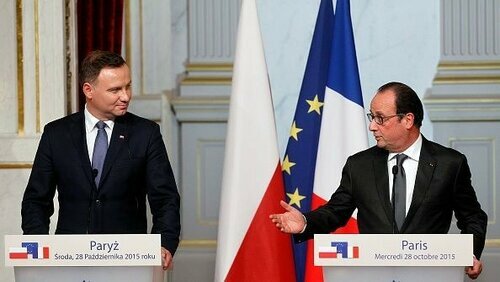 During their unofficial meeting, they tried to ferret out some common ground between their governments, looking for a way out from under the liberal press that is suffocating Europe. Warsaw’s anti-Russian agenda has previously had a deeply negative impact on the work of the Visegrad Group, to which both these Eastern European countries belong. But now this situation is being viewed differently in light of the «axis of the nation states of Europe». That is almost a euphemism, but the bottom line – opposition to the supranational institutions of the European Union – is clear. At the heart of this policy lies a sense of Euroscepticism, as well as the «Jagiellonian idea» («idea Jagiellońska»), or the desire to maintain a vigorous presence within the sphere of «Polish cultural influence», which Warsaw believes to include Lithuania, Belarus, and Ukraine. This recent Polish «resistance» to European supranational institutions is a development worth closer inspection. And that examination can best be done through the prism of History, which is, incidentally, something that the Law and Justice Party is naturally inclined to do. However, it is worth remembering that there was a time when the Russian border followed a boundary line that was fair to all ethnic groups, almost retracing the famous Curzon Line. Russia established sovereignty only over the Belarusians, Ukrainians, and Lithuanians. And only after Polish attempts at revenge did Russia seize slices of historically Polish territory, although not from the Poles themselves (! ), but from Austria and Prussia, creating a buffer within the borders of the Russian Empire, which took the form of the Kingdom of Poland. This is a reminder of the past – not an end goal. The fact that the «Jagiellonian idea» is the party line for the PiS suggests that the dialog between today’s Poland and the West, and also the East, will be largely rooted in History.